I am so not a chocolate eater. I think we’ve been over this before. I am a total sucker for fruity and cakey desserts. Creme brulee, too. Key Lime Pie…and…oh goodness…pineapple upside down cake. Drool. The upcoming RootSource Challenge – hosted by CookThink – was to use pineapple in your recipe. Rather than try to use it in some sort of rice dish – or in the typical upside down dessert – I wanted to do something a little different. This just so happened to coincide with a shoot that I was working on for a client. There were some recipes that they were developing to post on their website lying around – I never talk about clients on this blog…but when you’re there, you’re family, ok? 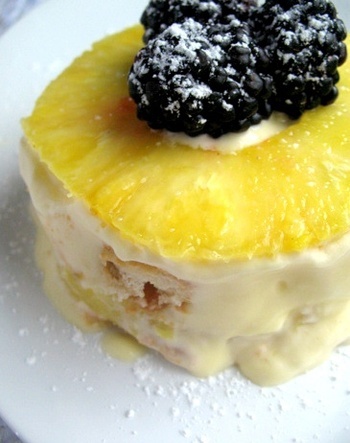 The recipe for Pineapple Tiramisu caught my eye. Talk about a dream dessert – all of the creamy, custardy, Mascarpone-y goodness of tiramisu with a blast of fruit flavor! I was sold. It is everything I had hoped it would be – creamy and sweet but not overly so…and punctuated by juicy pineapple taste and texture. I changed the recipe up my making them in individual spring-form pans – 4 small pans will be filled by this recipe. This also helped in keeping its shape. If you don’t care about that, make it in a trifle bowl or individual dishes. I also soaked the ladyfingers in an equal mixture of Malibu Pineapple Rum and pineapple juice. Instead of covering the top of my forms with the berries, I wanted to show off the ring on the top. So, instead, I garnished with a few blackberries and powdered sugar. Any mixture of fruit to garnish – as well as mint or basil – would be tasty and beautiful. When making this recipe, beat the crap out of the eggs. Seriously. Until clear, at least. You will regret it if you don’t. I also recommend refrigerating this for longer than an hour – several hours to overnight would be best. – WHISK egg yolks and 4 tbsp sugar together in a mixing bowl. When the color turns clear, add mascarpone cheese and stir until consistency is smooth. – REMOVE skin from pineapple with a large knife. Cut in half and remove core. Cut a 1 inch slice from the bottom. Place in a food processor with 2 tbsp sugar. Pulse until fruit is finely chopped and has released juice. – DRAIN contents into a strainer and preserve juice. Discard chopped pineapple in strainer. – CUT remaining pineapple into 1 inch slices. – SOAK 10 lady fingers in pineapple juice until liquid is absorbed. Do not allow them to sit too long. – PLACE a layer of lady fingers in a round mold. Cover lady fingers with slices of pineapple. – ADD a thick layer of mascarpone cream. Repeat process. – GARNISH by alternating lady finders, remaining pineapple slices, sliced strawberries and wild berries. – REFRIGERATE for a minimum of 1 hour before serving. I think you will take the cake on the contest. This is a very cool recipe. What a fun and different idea! Great combo! Sounds tasty. I bet that pineapple’s acid cuts beautifully through the heavy stuff. WOW! i LOVE pineapple! like you, i love anything w/fruit…and i am a huge fan of tiramisu :) can’t wait to try this! Oooh interesting take on the tiramisu! Nicely done. This looks interesting. The stodgy side of me is saying, “Pineapple in tiramisu? Blasphemy!” while the rest of me is saying, “Where can I get some?” Seriously, though, it looks good.